Andreas Pereira has warned Juventus that Manchester United are "pumped up" for Tuesday's Champions League meeting following an improvement in their performances. Jose Mourinho's side ended a four-game winless run by coming from 2-0 down to beat Newcastle United 3-2 before the international break and were seconds away from ending Chelsea's unbeaten start to the season on Sunday until Ross Barkley salvaged a 2-2 draw. United fought back from going behind to put themselves in a winning position in each of those matches and Pereira thinks they are showing signs of the fighting spirit of the great sides of old. "We have shown that we can bounce back, that we still have faith and we are the Man United that everyone talks about," he told the club's official website. "It's never finished with us, we always keep going. We can always bounce back and change a game around and if we keep doing well hopefully more wins will come. "It was difficult at the start of the game [against Chelsea] but like the manager has said to us, we need to keep our confidence and keep doing well. In the second half, we scored two very good goals and then in the end we were a bit unlucky with the second goal we conceded. But I think we did very well and deserved more. "I think this gives us a lot of confidence for Tuesday and the manager gives us that confidence, too. We take a good feeling into the next game. We're very pumped up for Tuesday." 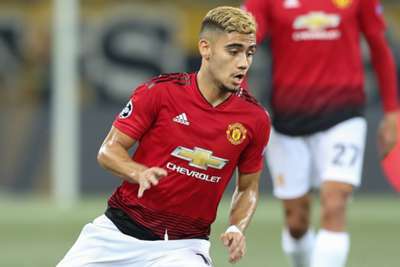 Pereira was a late substitute in the clash at Stamford Bridge, having not played in the Premier League since the 1-1 draw with Wolves at Old Trafford on September 22. Despite nearly a month on the sidelines, the 22-year-old was happy to be given a chance to impress Mourinho. "It shows me that the manager has faith in me and I just want to push on when I get on the pitch, to show him what I can do for the team," he added.